Corona, CA (Sept. 24, 2014) – Corona® introduces a new line of tools for hydroponics, an increasingly popular, highly controlled production method that reaches across many different markets.The $617M hydroponics business is a growing trend among urban farmers, medicinal herb growers, commercial growers, DIY home gardeners looking to continue gardening throughout the winter months, and organically-inclined consumers fueling the demand for tasty and good-looking new edibles. The new Corona® line of Hydroponic Micro Snips and Scissors deliver the precision cutting and versatility needed in hydroponic production, season after season. The large finger ring in the durable ABS plastic handle of the FS 4110 Finger Micro Snips ($6) enables continuous, two-handed work without having to set the tool down. Lightweight comfort with a soft touch feel, coupled with sharp, stainless steel 1.4 inch blades and tips, deliver precision cuts. The “Corona Red” color makes the Micro Snips easy to spot on a hydroponic garden bench, while the spring reopens the blades after each cut. The push button thumb lock provides safety while not in use. Both handle and blades can be sterilized to limit cross cut contamination. Sharp, stainless steel 2.3” blades on the compact FS 4120 Micro Snips ($15) have double beveled tapered tips for precision cuts. The heavy duty spring provides reliable performance, and the pivot bolt adjusts for a personal feel. The red color makes this tool easy to see and both the handle and blades can be sterilized to limit the transfer of contaminants. A double-sided lock provides for left or right hand use. Stainless steel scissors with 2 inch blades with double beveled, tapered tips on the FS 4130 Scissor ($14) ensure precision cuts. Generous, easy-to-see red “butterfly” handles are durable, offering lightweight comfort and performance. The entire scissor, both handle and blades are easily sterilized to limit cross contamination. Corona® Tools has been building trust through performance for nearly a century. 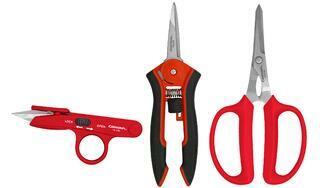 Look for Corona® hydroponic snips to round out hydroponic, indoor gardening and general fine gardening efforts. These essential hydroponic tools are now available and fully stocked at CoronaToolsUSA or at your local Corona® dealer.